We are a local company that does NOT hire out-side subcontractors to do your dirty work. We have a reputation of quality and reliability with local Fire Marshals and Insurance Companies. Hood-Tek offers The Tampa Bay Area with around the clock 24-7 Grease Exhaust System Service. With Hood-Tek, you’re not just a corporate number. You are able to speak with the owner about your restaurants concerns. We are not pressure washers that clean hoods as a side line. 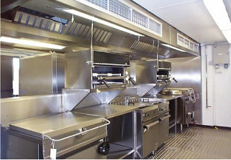 Kitchen Exhaust Systems are all we do. Our cleaning Teams work to provide you with environments that are safe and clean for your staff and customers. Hood-Tek offers only the best when it comes to customer satisfaction and friendly service. We are just a phone call away to provide your restaurant immediate service and peace of mind. The Pub, Cheddars Casual Café, Golden Coral, Geico, Frank Crum, Crabby Bills, Courtyard Marriott, Westshore Pizza, Whole Foods Store, Gigi's Italian Grill, Cody’s Roadhouse, Bella Brava, Parkshore Grill, Doubletree Hotel, Sheraton Sand Key, Lifepath Hospice and Melech House.